Note: Online Course paid for in PayPal will be delivered manually within 24 hours of purchase. Begin a new journey of weight loss and spiritual peace. Hurricane Harvey has carved a path of devastation, leaving many people homeless and suffering. Several Wiccan friends have expressed their concern about not having money to make donations to ease the victims’ suffering. If you’re enduring a financial hardship, here is a simple spell so you can send a blessing of energy in lieu of money. With this Money Attraction Spell, you can create a “magickal check” (on virgin paper). The point is that you are using this magickal check as a symbol that will draw the energy of the Universe to the benefit of the victims of Hurricane Harvey’s devastation. Cleanse and consecrate your candle and magickal check with your holy water. Charge the candle and magickal check with the dragon’s blood incense smoke. Dress your candle from wick to base with your money oil. Dip your quill into the dragon’s blood ink to draw up your magickal check. Write down an amount of money that you want to go to a particular Hurricane Harvey-related charity. To help soothe all your woes. Place the magickal check on your pentacle and put your hands on it. Concentrate on money flowing to the victims of the disaster. See them getting the vital things they need: fresh water, food, dry clothes and warm beds. Focus all of these thoughts into the magickal check. Place the candle in the candle holder and set them on top of your magickal check. Help give comfort, save their day. Clean up this disaster all about. Let love, and human kindness live. End this pain, let the Gods be with you. Do your Cakes and Wine Ceremony. May this ritual ease your heart and help the victims of Hurricane Harvey’s devastation. “What is going on? I have so many spiritual friends who are having trouble with money,” my friend, Sabrina, said. Wiccans do have possibilities to use magick to ease their burdens. Here is a ritual to increase your money flow. Do this ritual on the waxing moon, for a duration of seven days (before the moon is full). If you can start on a Sunday, even better. Combine all three oils in a carrier oil such as jojoba oil. Let the combined oil sit in the moonlight for three days. Allow it to stand in the dark for three weeks. Do not let it sit in the sun. Mix ingredients with mortar and pestle, and let the mixture sit for three days before doing the ritual. Do not let it sit in the sun. When the time is right, begin your ritual. Place the candle in the candle holder. Place them on top of your $100 bill. Repeat the Money Drawing Oil chant three more times, while concentrating on the candle. Envision seeing your wallet/purse stuffed with money. Envision being able to pay bills and getting the things you need and want. When you feel you have this image firmly in your mind, light the candle. Keep concentrating and focusing on your goal until the first knob has been consumed. Snuff your candle with a candle snuffer. Caution: Do not blow out your candle. This will blow out your intention. For six more days in a row, repeat lighting the candle and focusing on your intention—with each knob. Once you have finished all seven days and the candle burns itself out, take the $100 bill and place it in your purse or wallet. Carry the bill to attract more money. Once you have what you desire, give the bill to charity***. May this help you on your financial abundance journey. *** An Important Consideration: Sometimes more than one ritual is needed because a person has significant blocks. If the ritual doesn’t work the first time, you may have to directly address your personal blocks to financial abundance. In a gathering of friends, some conversation about money arose. You could see it. Some of the people gathered bristled. I like to talk about prosperity which includes an abundance of love, friends, things we need and the ability to be generous. “Sure,” I said. I was buying a Big Gulp, and I bought him one, too. “Thank you,” he said, quietly. I was grateful that I had the cash in my pocket to buy something for both of us. Sometimes, we simply need cash to buy something for another person or to pay our bills. In light of that, here is a Money Spell. * We create a check from the Universe by writing the amount we want and writing “from the Universe for the Good of All” in the memo section on the check. Warning: ONLY work this spell during the waxing moon. As you dress the candle, envision money flowing into your life. Let it rain money, bless my journey. An it harm none, so mote it be! Now hold the “Check from the Universe.” Light the check via the candle and place the check in the cauldron to burn safely. Watch the flame as it burns the check. Meditate while focusing on the flame of the green candle. The above spell has worked for me. I had difficulty receiving appropriate checks and things cleared up. I was grateful! May your journey be prosperous and happy. P.S. Often, we Wiccans like to customize our spells. For more information about this, sign up for my E-Newsletter because I’m going to be sharing information about customization in my next installment of my E-newsletter. Happy calendar New Year to all my readers! Many of us want to start off the calendar New Year right. We tend to make New Years resolutions. Many of us want to manifest more prosperity in our lives. Let’s avoid the first mistake in prosperity magick: tending to focus on one’s outer environment verses the inner self. Yes, you can ask for prosperity to flow to you. But the better way I have found is to empower yourself to create more income. In this way you’re not just asking for a handout. Instead, you place energy into yourself to create inner change. That’s where the real magick happens, and this creates the most benefit for you. Why do I say this? To change yourself is to change your world. We perceive the world around us. We can see a world of roadblocks or we can see opportunity. It’s our choice. Below I’ll share a ritual called New Years Prosperity/Opportunity Ritual, in which you’ll be able to exercise your choice. Always bathe before doing a ritual. Some ask, “Can I take a shower?” If you do not have a bathtub and only have a shower, you can still soak the herbs (I specify them below) in a large bucket of warm water. If you take a shower, you can clear the debris of the day off first. Then, you have a choice: a) you can pour the herbs-water of the bucket upon yourself or b) you can use a cloth and wash your body with the herbs-water. Shampoo* and soap* preferably herb-infused form the best choice. Wiccans use lavender to help sooth and calm themselves to get their head in the right space. To prepare a sachet, begin with a 4×4 inch square piece of cheesecloth and some string to close it. Use these Bath Herbs: Basil, Ginger and Pomegranate. Place the bath herbs into the middle of the cloth. Then pull up the four corners of your cloth and tie them together using the string. If you don’t have cloth, you can also use a clean sock or stocking that hasn’t been used before. Next draw the water for the ritual bath and place the sachet in the water. If you desire, light some candles and burn some incense. Do your part and invite the Gods to guide you in how you can make a bigger and/or better contribution and thus expand your income. I now make them open. Make the sign of the pentagram on your body [by touching your forehead followed in order: the left breast, right shoulder, left shoulder, right breast and back to forehead]. for the good of all, I now claim my space. Fill me with light so my desires take place. May you and the Gods manifest the best for you in this calendar New Year. Happy Imbolc to everyone. Hope you enjoy the post. Have you heard in some form that “money is not spiritual”? There’s a real problem: ignoring money or actually looking down on having money causes unhappiness. Some say that having denial about money issues causes many people to end up poor and unable to take care of their own basic needs. In Wicca we know our Gods want us to be happy. With this as true, does it make sense that our lacking money is what they want? No. Now I’m not saying you need to be making buckets of money or that it’s necessary to have a whole lot more than you need. But for many in our community money is elusive. Why? For a number of individuals, Wicca was not their first taste of spirituality. They may come from different faiths that look down upon having money. The horrible part is that debilitating beliefs about money often stick in a person’s subconscious mind. And these sick beliefs push us to be unhappy. Is it money? No, fear is the root of all evil. Think of it. Fear pushes us toward greed. Fear of never having enough. I remember the famous line from Gone With The Wind: “I will never be hungry again!” In that film, Scarlett O’Hara does extreme things because of her huge fear of being hungry or losing her property. Is it possible that having money can frighten us? Yes, that can be a problem. Some of us have been conditioned to think that rich people are money-obsessed and that they do bad things. So on a subconscious level, some people are afraid of losing themselves and actually avoid opportunities to become rich and successful. Again, I call these sick beliefs. Some of us are really afraid of having money. It continues to come from subconscious beliefs drilled into our heads that money was not spiritual. Instead, I suggest that money is spiritual. Money creates opportunities for us to be happy. It creates safety for us and our families. The Gods want us to feel this way. If we’re doing well with our personal money situation, we walk around with an air of positive energy. We can be compassionate to others. Expressing compassion is an important part of one’s spiritual path. We have many ways of creating prosperity. I think just doing money spells is not the full answer. Ideally, we would use magick to get to an inner state where we can work out problems that prevent us from enjoying financial abundance. We can do meditations and inner work to change the limiting thought patterns and beliefs we have about money. (For more about this, see a free chapter from my book The Hidden Children of the Goddess. CLICK HERE. 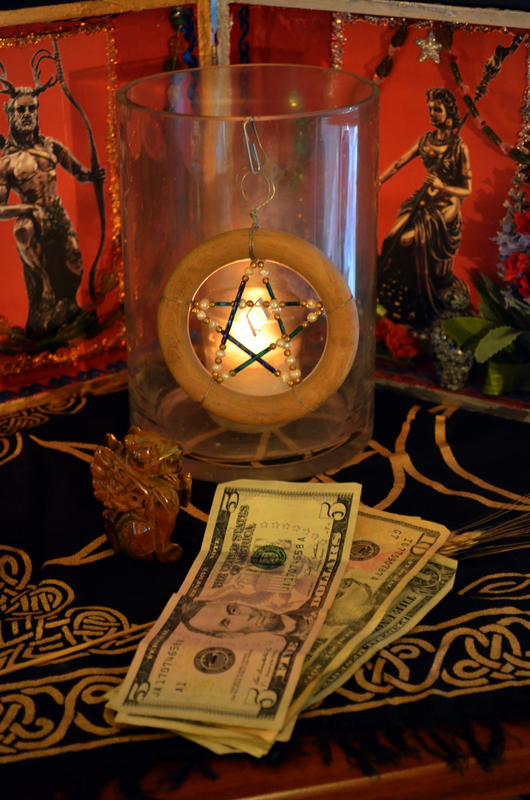 Some Wiccans may default to doing prosperity spells to gain money. However, it may help more for you to do a healing spell so that any blocks dissolve to learning how to earn more money, save money and improve spending habits. A rich person has a high income, which is a stream that can feed being wealthy or being in debt, depending on how that money is used. There is no shortage of people with high incomes but no real wealth. . . . Wealth is not a flow of income; it is a state of positive finances. What is a state of positive finances? Such a state includes enough money for bills, some money for entertainment, savings for tough situations in life, some money to be kind to others, and savings towards one’s retirement. Positive finances is not about having just enough to barely get by. It is really about having some amount of financial abundance (more than enough). To live in lack (including difficulties about money) really isn’t the Gods’ and Goddesses’ plan for us. They invite us to grow, learn and adapt. They invite us to learn something about creating financial abundance.